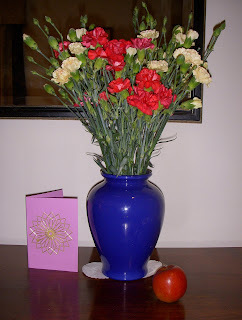 My arrangement titled "Still Life With Flowers Card And Apple". Is it art? We are all looking forward to meeting you." What a lovely gesture of welcome! The two pictures below show my room at Haley's. DP must have spoken up for me to get this bright and spacious room. 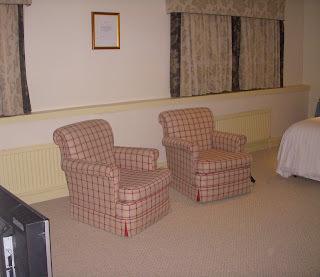 I had what amounted to a bed-sitting room, and I did not feel cramped into a small hotel room. Since I was there for an extended stay, it was good to walk into a room like this when I returned to the hotel dead tired in the evening. The curtains were closed when I took the picture, so you don't get the full effect of how bright and cheerful the room actually was. The bathroom was lovely, too, equipped with one of those wonderful deep English bathtubs, which - alas! - I could not use. If I had got in and sat down, I would not have been able to get up due to my ruined knees. 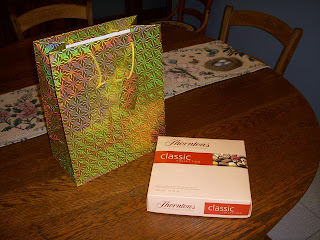 Below is a picture of the gift bag from the staff of the hotel, which included Thornton chocolates and good strong Yorkshire tea. We're already into the second layer of the chocolates, and they are delicious, and I've been drinking the tea every morning with great enjoyment. I've never had anything more than a chocolate on the pillow at night from hotel staff. I was overwhelmed! We hope you have enjoyed your stay here at Haley's. Can you believe this? It's hard for me to believe that it wasn't all a dream, but I have the evidence. I had to take the tea out of the box and put it into a plastic bag, because I couldn't fit the box into my suitcase. I believe the folks "over there" love me more than the folks here at home. Of course, they only had to put up with me for a few days. Those here have to live with me, which is a whole other thing. I am a big fan of Yorkshire Gold. A couple of years ago I was visiting a Rector friend of mine for Christmas (she had asked me to sing the Midnight Mass for her, as my voice is marginally less bad than hers, and her regular associate, who sings beautifully, was playing the organ), and at some point in the present-unwrapping, she opened a package given to her by a co-worker or other acquaintance of some sort. It was the "regular" Yorkshire blend, and I of course had to say something about how that blend was ok, but the Gold was much better, etc., and so forth. Then I opened _my_ next present, from my hostess, and (of course) it was a box of Yorkshire Gold. My friends in Oxford, btw, say it tastes like goat urine, which leaves me wondering just how they would know. 4 May, I love it. It has a kick all right, but that's what I want in the morning. It tastes good to me. I can't say about the comparison, never having tasted goat urine. It´s all good...at least I love Tea, all types, even the strange mixture a ¨healing woman¨ aka ¨indigenous healer¨ out in the rural high plano woods gave me to drink (after doing magico stuff over it)...it was vile except she told me how happy my insides would be...I bought a bagful (it´s still in my veggie bin in the refrigerator)...anyway, Tea and Chocolates and YORKSHIRE (did you have any Yorkshire Pudding?) my favorite meal of all...Roast Beef and Yorkshire with lots of Brown Gravey...it´s in my blood...as my Dad was from Hull. Tea drinking is a pleasure I have never taken to. I've tried, even throughout one Lent when I gave up coffee, but I didn't really like it. There is a compensation though, for whenever a parishioner asks me "More tea, Vicar?" I can reply, "No thank you, it gives me wind!" Leo, I did not have Yorkshire pudding. How did that happen? I'm not a big eater, and I don't often order dessert. When I have dessert, I order something light, like crème brulée. I should have made a point to order it at least once, shouldn't I? SR, tell me you're joking. Your parishioners would surely send you packing. Dear Grandmère Mimi, Yorkshire Pudding isn´t a postre...it´s like a hot bread surved with Brown Gravy over it (usually, at least at our house, with Roast Beef every Sunday). It´s a simple dish that made in the very hot drippings of beef and then you cut it like a pie and serve...simple: Flour, Milk, Black Pepper, Egg...whip together and pour into a pie pan with small amount of drippings (or if you´re really authentic, the families Yorkshire Pan) and put it in the REALLY hot oven for about 20-30 minutes...serve immediately (it´s horrid cold) and looks volcanic. Ah, Leo, that's right. Yorkshire pudding is not a sweet. I forgot. Oh my - that looks just delightful and so welcoming. And what a nice thing Mrs. DP did in leaving that for you! When Michael and I visited Ireland, I became addicted to Irish tea. I have to go to certain delis in Manhattan and in Irish neighborhoods to find it here. I really like good strong black bohea. Everything else is just herbal tea or water with food color in it as far as I'm concerned. I'm glad they loved ya there, but we're delighted to have you back here. I started drinking tea years ago when I had a bout of the Asian flu. I just didn't want coffee while I was sick. Afterwards, I tried to go back to coffee, but I decided I liked tea better and have never turned back. It's good to be home with family and friends and back with my blog friends. When are we going to meet, Counterlight? My travel money is used up. I realized the last time I was over there that one reason English tea seems stronger than ours is that they put about twice as much tea in a bag. Yorkshire Pudding is what you get if you make popovers all in one dish instead of muffin tins--or vice versa, I guess I should say. We really should meet for tea someday. I'm afraid my travel money, and time, is short this year. As a new hire, I'm required to teach summer school. As a mid-year hire, I get no pay in July and August after I finish summer school; just the institution's way of saying how angry they are now that they have to pay real money for the same work they got for almost nothing for 7 years. Peccato! as the Italians would say. 4 May, the first day I made the Yorkshire tea as I usually do, with one bag (or teaspoon) per cup and one for the teapot, but that was too strong even for me. Now it's one bag per cup. I've a lot of crow to eat because of all the negative comments that I made about English food, because I had not a few excellent meals on this trip. Counterlight, I love it. They gotta pay ya now. One day we'll have our tea together. Yorkshire pudding can be quite sweet if one cooks it in butter instead of drippings, and then sprinkles powdered sugar on it with a little fresh lemon juice. Delightful for breakfast --call 'em dutch babies. Grandmere, popovers with tea is a good idea! I love tea, too. I was drawn to the cheap tea... Typhoo brand, made very strong with lots of cream and sugar. Every time someone goes to England and asks what they can bring me I always say "Go to Sainsbury's or Safeway and bring me Typhoo Tea in the Red package." An Englishman once told me that it was 'the Sweepings!!' as only an Englishman could. I must be of the lower classes. George Orwell mentioned 'Typhoo Tips' in "Keep the Aspidistra Flying." so it must be the Prole tea. 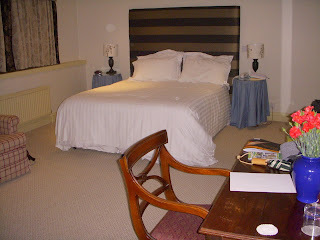 Oh, and what a lovely room! My room was special. Erika and her beloved stayed in my hotel the night of our gathering, and I saw their room, and, while it was quite nice, it was not as large as mine. One of these days, I'm going to eat Yorkshire pudding, so I can speak with authority about it. So Susan, you drink "the sweepings"? That's too funny. So Susan, you drink "the sweepings"? Well, the results of putting the sweepings into a pot and pouring boiling water over them! It has to be the 'finest' as in smallest bits of tea you will ever see. I liken it to the "trash" grade of tobacco we used to strip from the bottom of the stalk, very flaky and likely to break up into tiny pieces. He of course was talking about what they sweep up from the floor of the processing room after the best of the tea was packaged. You are an excellent photographer, Grandmere. You are well justified in being proud of your posted photos. It's been many years since I traveled in Europe, and I've yet to visit the UK. My experience was that the hospitality industry in Europe takes great pride in being really hospitable: personalized to each guest, guests recognized and greeted by name, and wants/needs provided for without the guest having to even ask. And I was traveling on the cheap! In America even expensive resorts often fail to provide such personal hospitality, much less the "Motel Cheaps." Thanks for sharing your experiences. I'm enjoying your trip very much. Susan, I use loose tea most of the time, and I don't like the "finest", because it passes through the strainer into the tea. Pat, there's truth in what you say, but these folks were outstanding. We hugged when we parted. They were like friends. I think it's true that in the US the staff tend to be much more impersonal. Of course, the hotel was small, which makes a difference. I've done a little reading about Yorkshire pudding, and I see that the filling can be sweet, although the usual filling is beef. It's sometimes a first course, rather than the main dish.